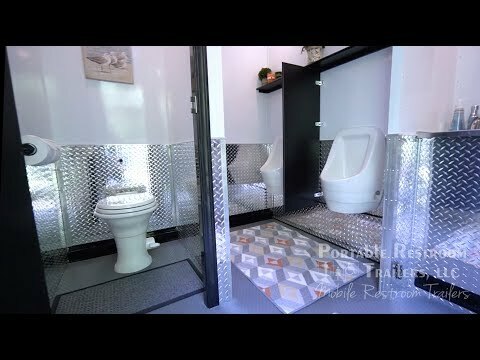 The 5 Station Industrial Portable Restrooms Trailer | Classic Series features both women’s and men’s public suite and impresses from the outset with its hard working diamond plate wainscoting! An attractive central powder room has a vanity with a stainless steel countertop and an oval sink, and under the cabinet storage for supplies. Off the central powder room for women, 2 private stalls, while men have one private stall and 2 urinals with privacy dividers. The 5 Station Industrial portable restrooms trailer includes hot water hand wash, 150 gallon freshwater tank, and 500 gallon waste tank. Your guests are sure to enjoy this 5 Station Industrial Portable Restrooms Trailer | Classic Series with the comfort of a fully climate-controlled environment maintained by air conditioning and heat strips, as well as a 3 Season package for cooler temperatures.